We’ve left the sights of Houston behind for another year and returned safely home. 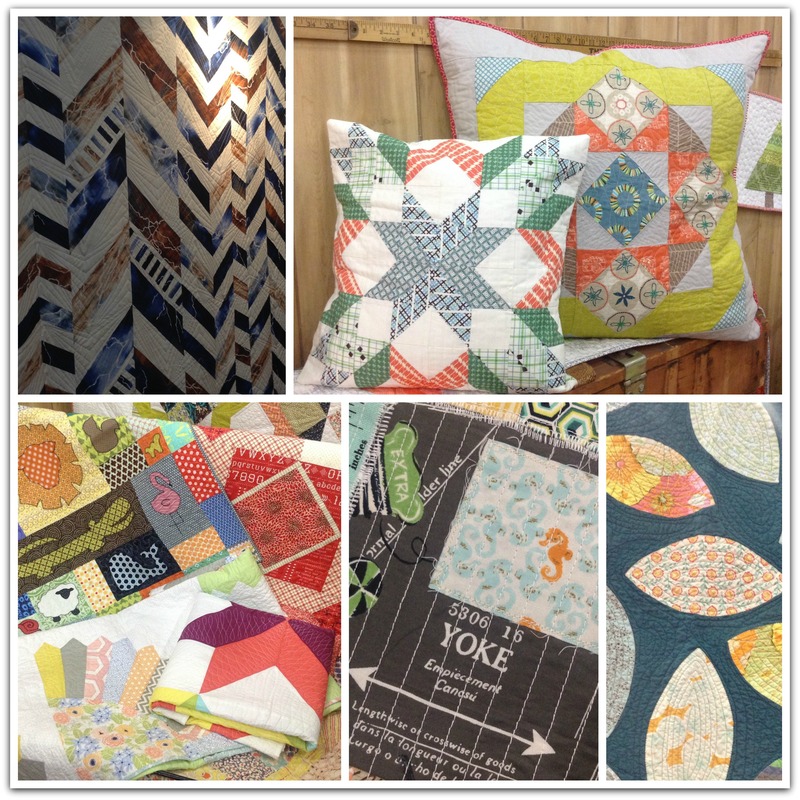 We spent a good portion of Monday traveling home, but we did get to visit Market one last time. After a short delay due to technical difficulties, here are the photos from Monday. 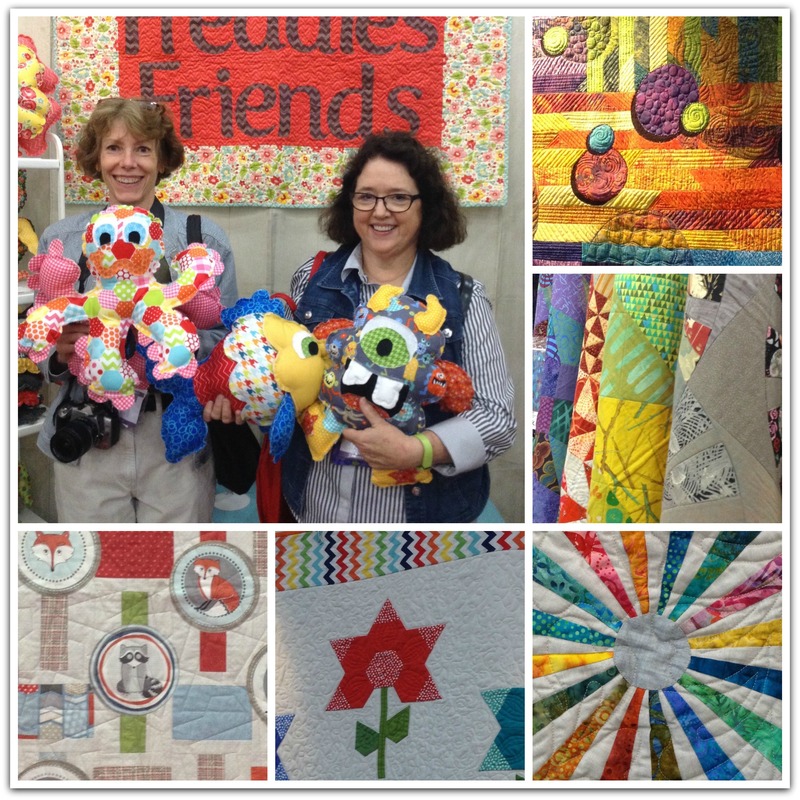 Thanks for joining us on our trip to International Quilt Market. We hope that you’ve enjoyed traveling along with us. 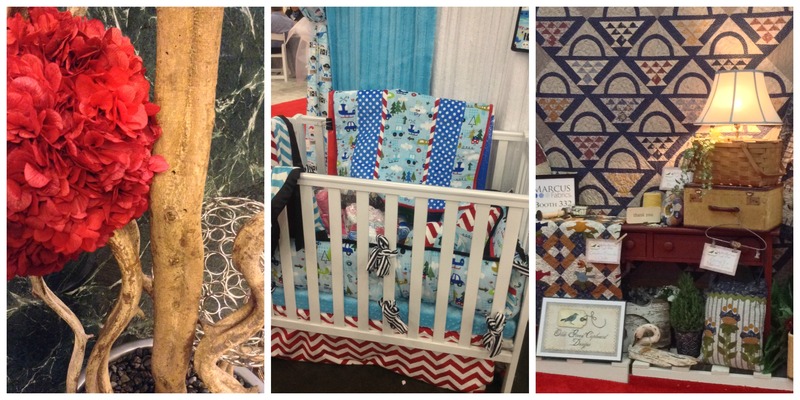 Visit us at both the store and at quiltexpressions.com for new products coming soon! I remember “reading” picture books to my kids when they were little. There were no words…just pictures. The goal was to tell the story as you saw it in the photos. The series of photos above remind me of those picture books. 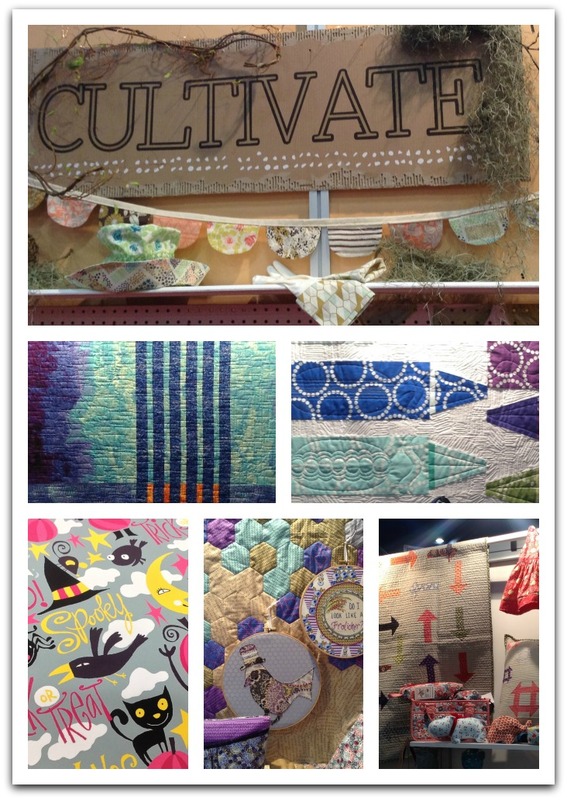 Day three of Quilt Market is a busy one! 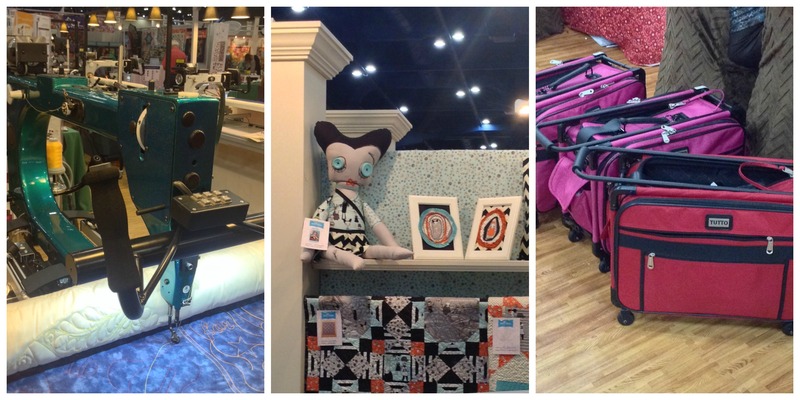 We spend the day before walking down each aisle, looking at all of the products and services offered. When Market closes for the day, we sit down, pour out the multiple bags of literature we’ve collected and decide what we want to give a second look to the next day. Very few purchases are made on day two. 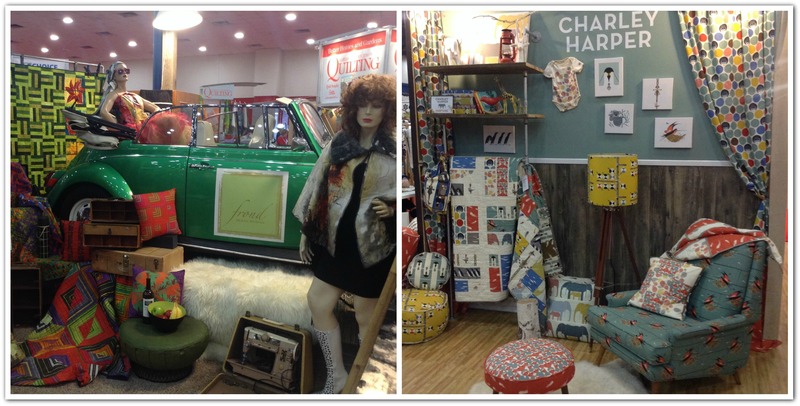 We started day three with a list of booths we wanted to visit. We met with some of our reps, who showed us collection after collection. 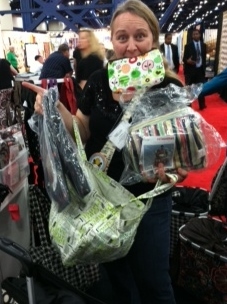 Photo #2 above shows the pile of collections Karen looked through in just one booth. Decisions are made and out come the order forms. It’s a strange feeling because, for the most part, we aren’t buying anything that will arrive in the store in the near future. 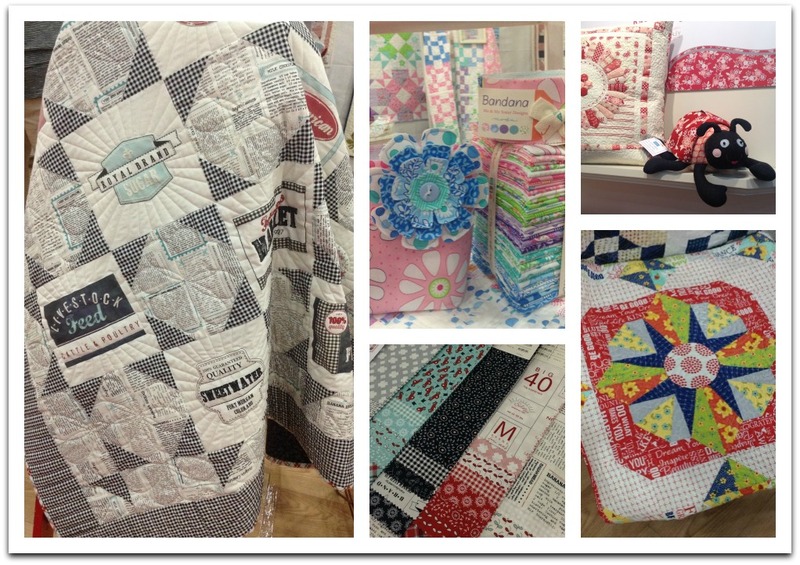 Most of our purchases today won’t arrive at Quilt Expressions until sometime between January and June 2015. 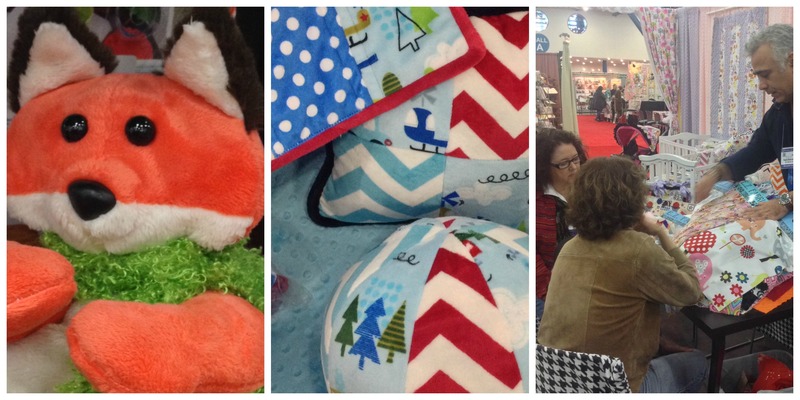 We bought a couple of Halloween and Christmas lines…for the 2015 holiday season. 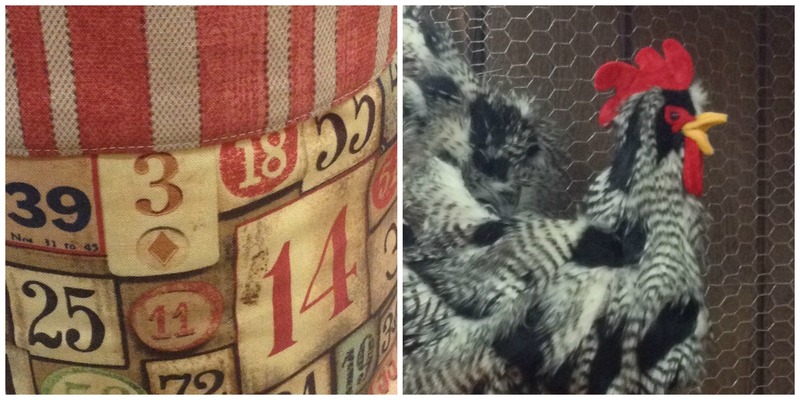 As we walked through the aisles today, I tried to focus on the textures created with fabric. 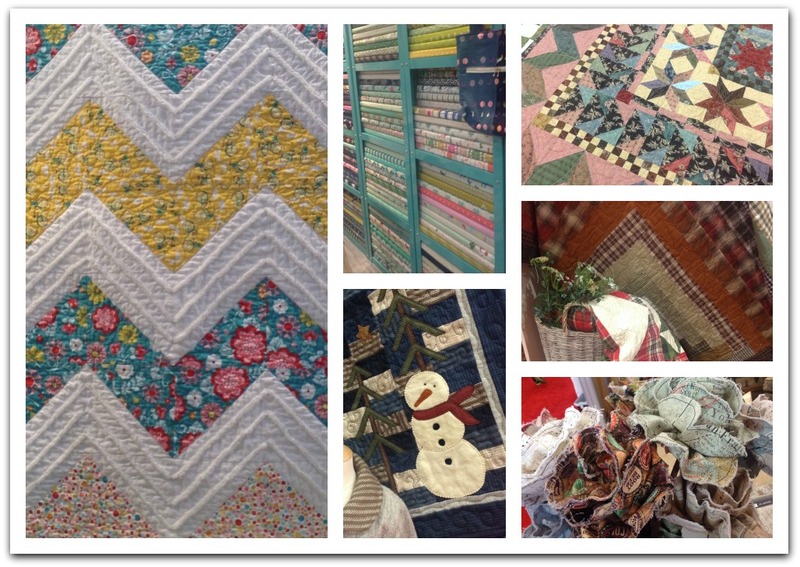 As you look through today’s photos, pay close attention to just what can be accomplished with fabric and/or quilting. 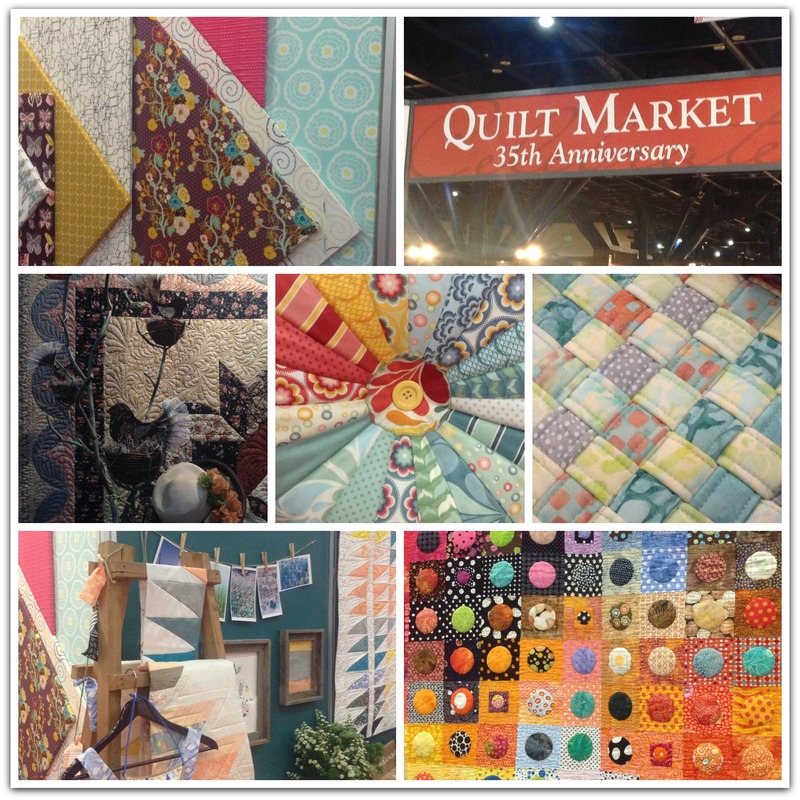 I spent the last half hour of Market today next door at the Quilt Show. They are celebrating their 40th year, and they are doing it in style! 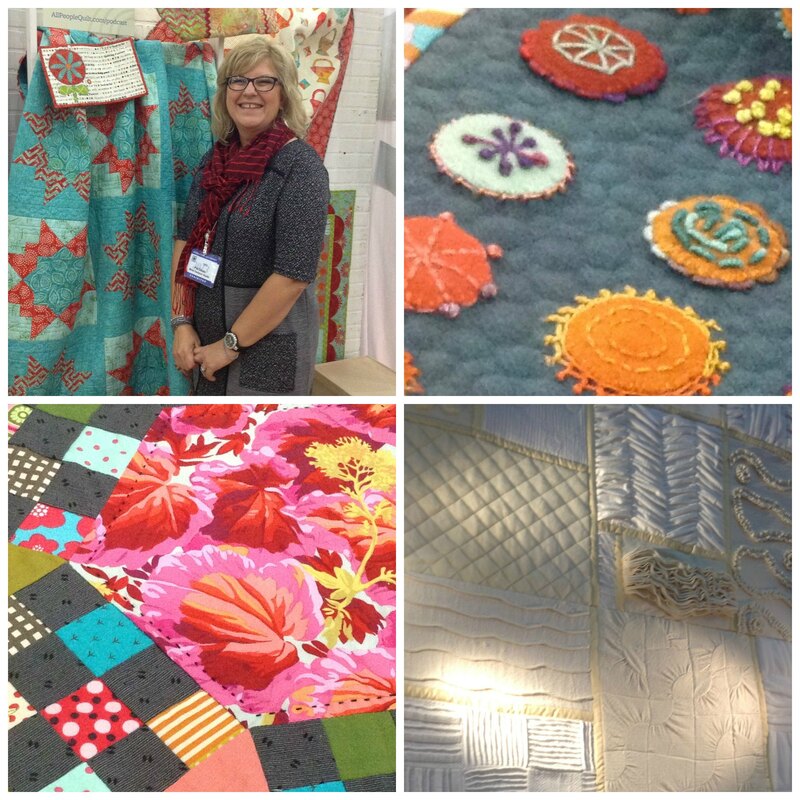 I’m including a few photos of the gorgeous quilts I saw in that short period of time. 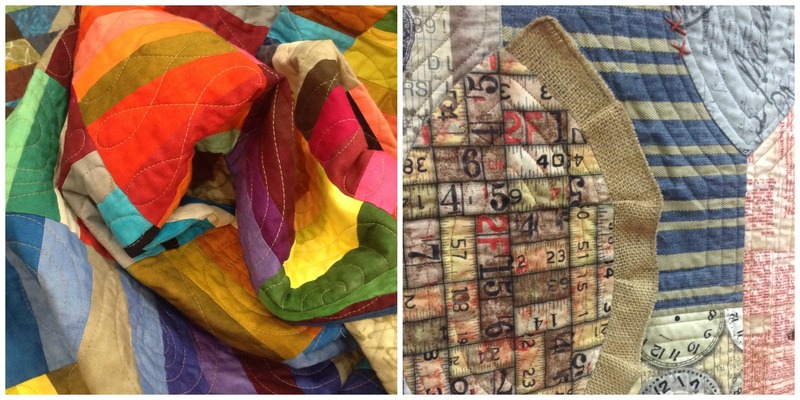 Not all of the quilts can be photographed…I wish I could have shared all of them with you. 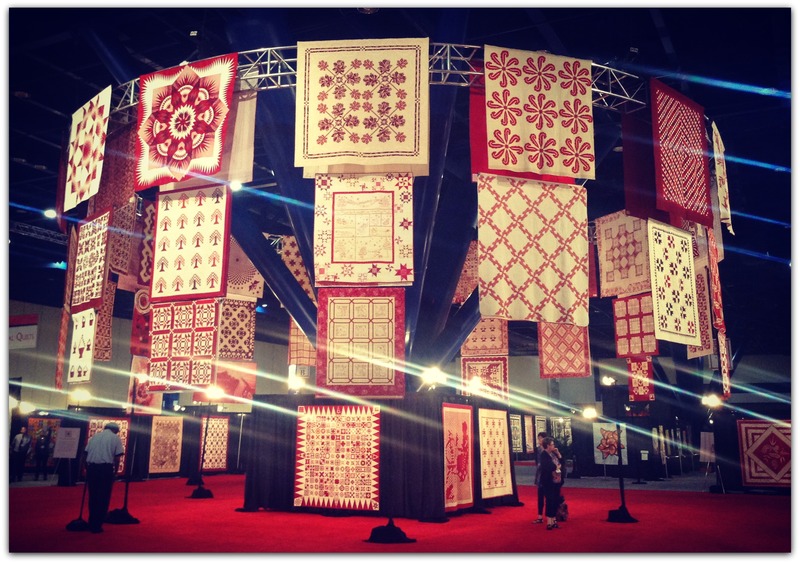 When you walk into the show, this is the first sight that you see…beautifully made red and white quilts from the floor to the ceiling. 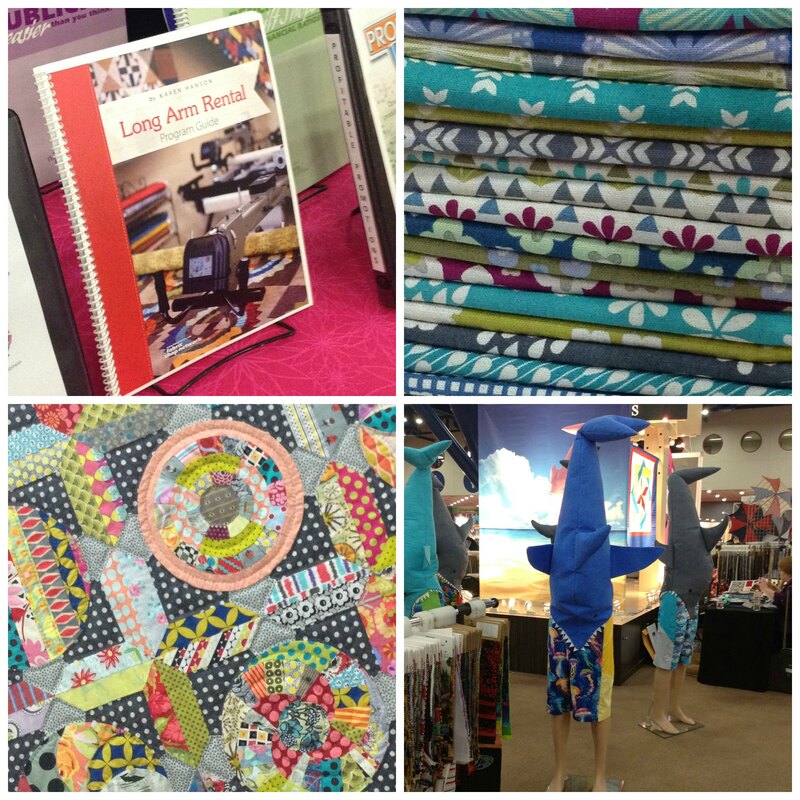 One of my favorite uses for technology in the store is using the camera on my cell phone to take a photo of a customer’s fabric collection. 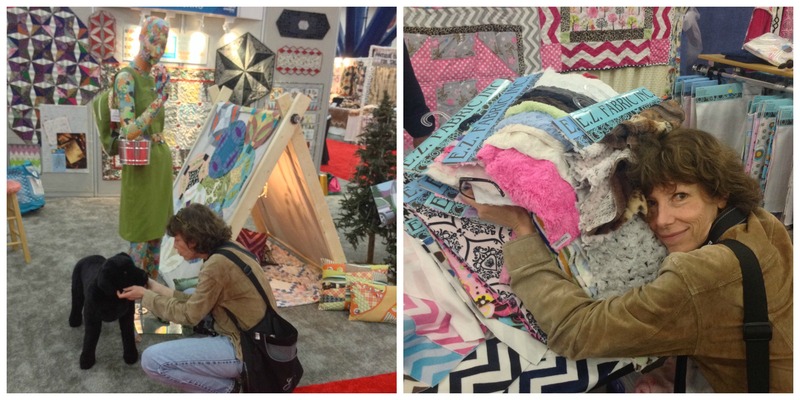 When you try to look at a group of fabric, you also see all of the other colors around you in the room. 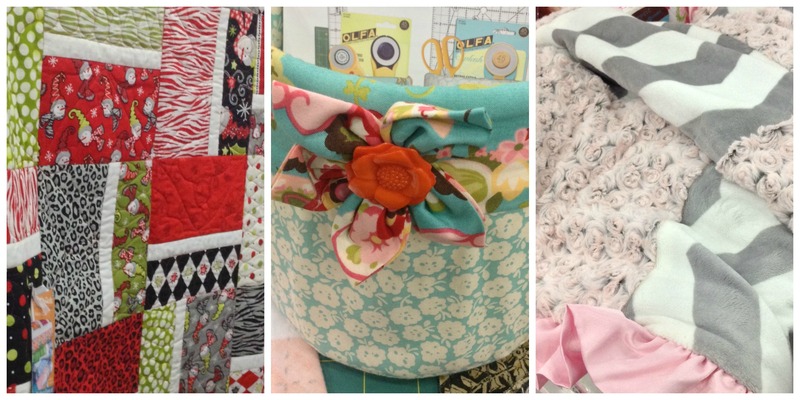 With a photo, you can crop out all of the other bolts of fabric, finished quilts, etc., and really see how those fabrics will look together. 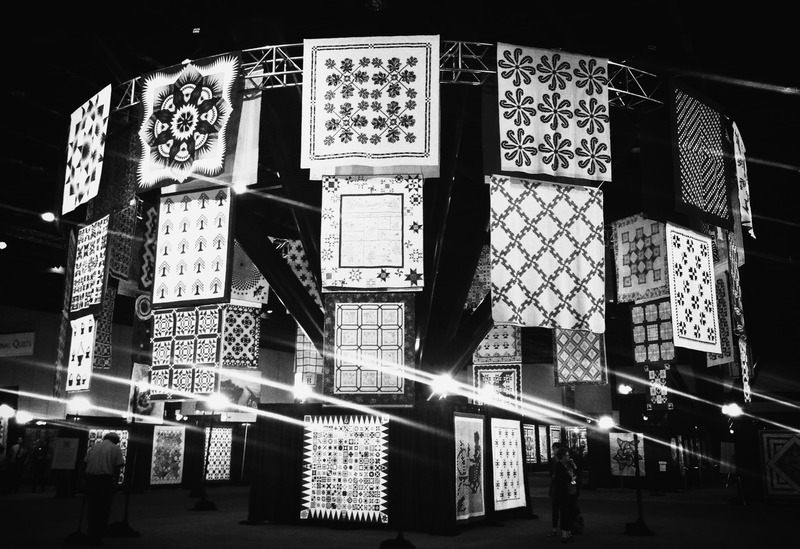 Another great way to use cameras in quilting is to take a photo and then change it to black and white. It’s a fantastic way to see if you’re obtaining the contrast you’re striving for. Just for fun, I changed the original photo to black and white. 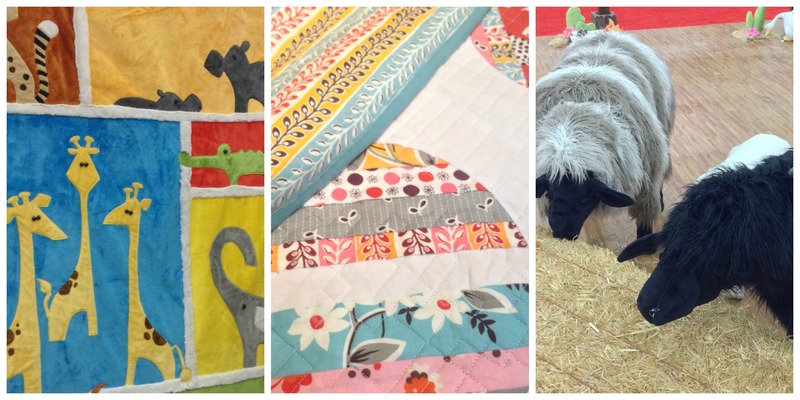 Even devoid of color, these quilts are amazing! 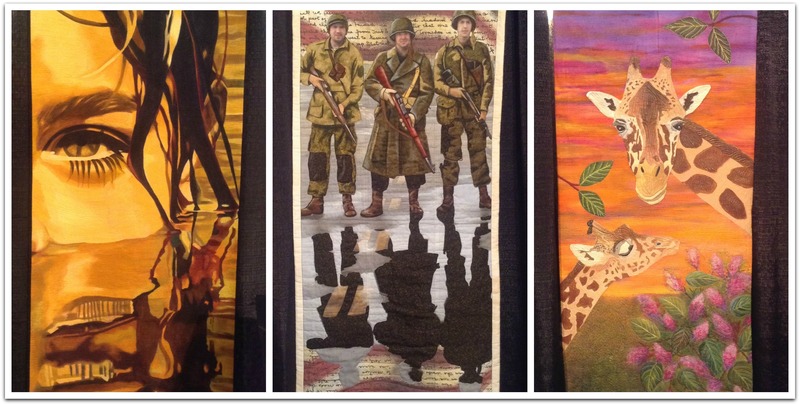 These are a few quilts from the “Reflections” display. 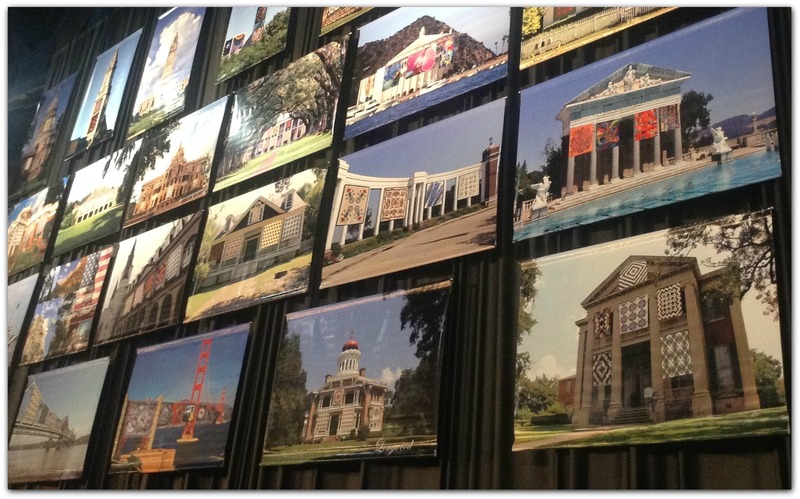 Finally, as the doors were closing, I passed a wall covered with large photos of quilts displayed on buildings or monuments with historical significance. Thanks for stopping by the blog today. We hope that you are enjoying sharing our Market experience with us. Tomorrow, we’ll spend part of the day at Market and then head to the airport. We land just before midnight, so the final Market post might be a day late. I almost forgot! Our Fitbit total for the day was 35,780 steps. There’s a whole lot of walking going on! Good evening! We hope that you all had a fantastic Saturday. 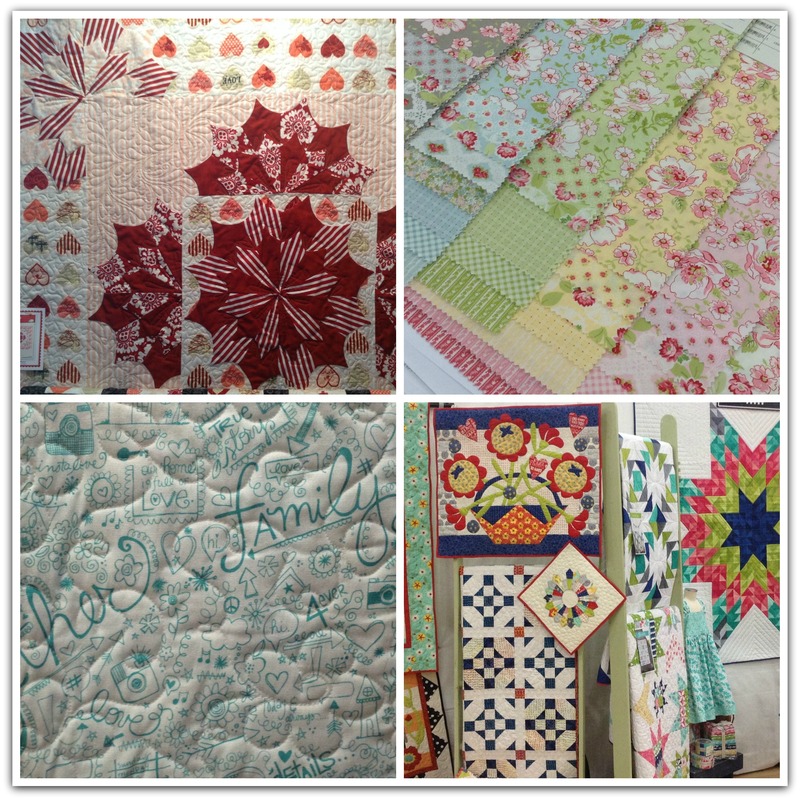 A very sincere thank you to those who posted your comments either on the blog or on Facebook regarding what inspires you to quilt. You all receive an A+! Alrighty then, let’s get down to business! Yesterday, there weren’t a lot of opportunities for pictures. Hence the long, wordy post and the homework assignment. Today? I might have taken a photo or two. First, a photo without a quilt, pattern or fabric collection. Remember last year’s “Day Two” post? You were treated to a photo of our walking shoes. This year? 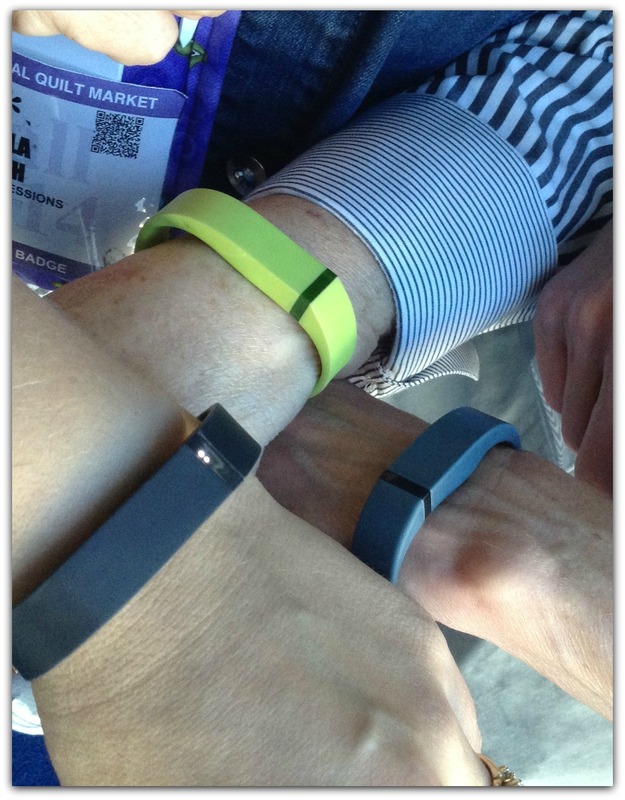 You get to see our Fitbits. 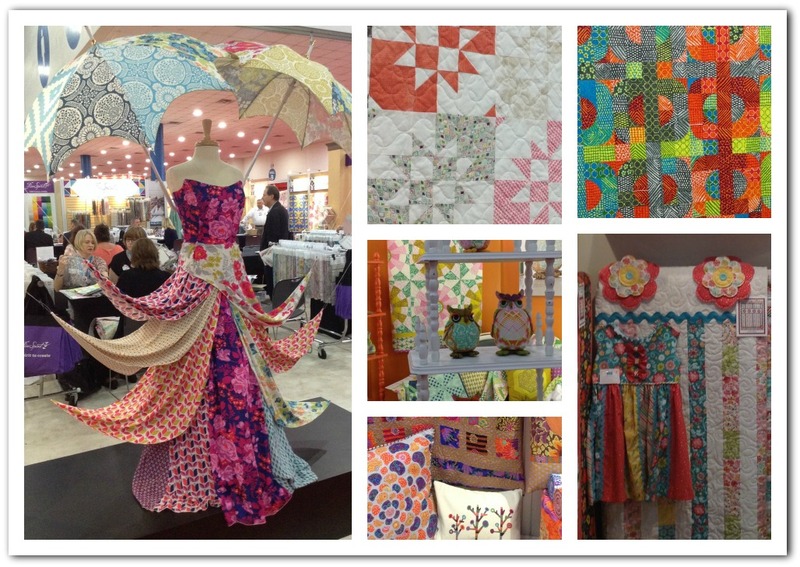 As of 9:30 tonight, we’ve walked down 24 aisles, looked at 633 booths, saw an amazing number of quilts, patterns and fabric collections, consumed six cups of coffee…and walked 38,351 steps between the three of us. So, tonight, no long, wordy posts. No homework. Just pictures…lots of them. Enjoy! 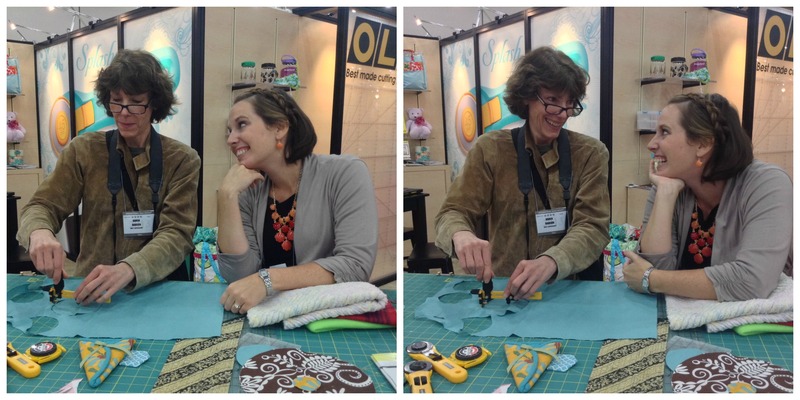 Left: the Quilt Expressions’ crew. 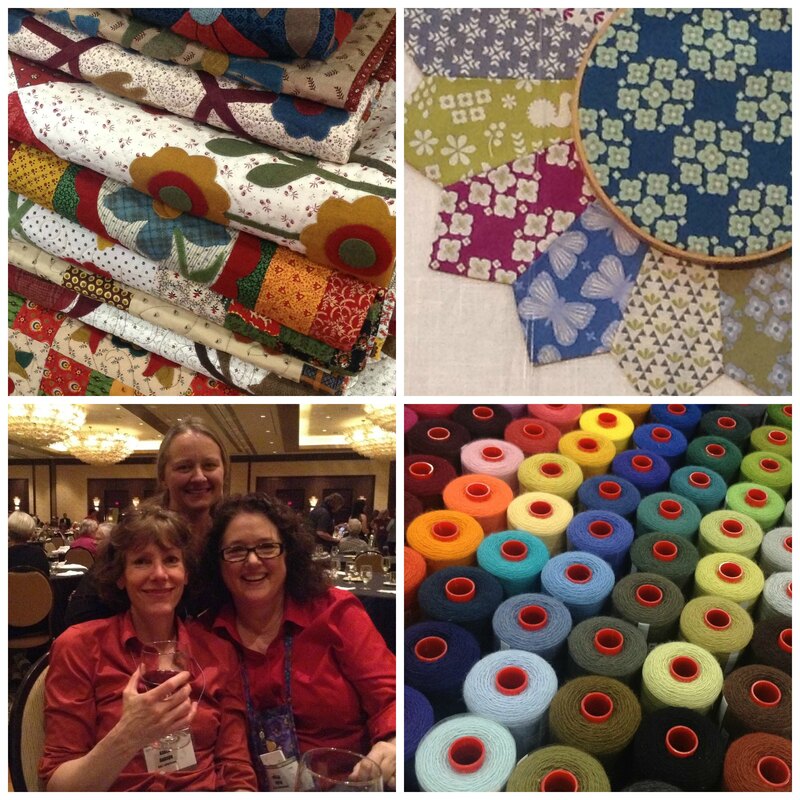 Center: Jane (our Moda rep), Della, Katie, Karen, and one of our friendly table mates. 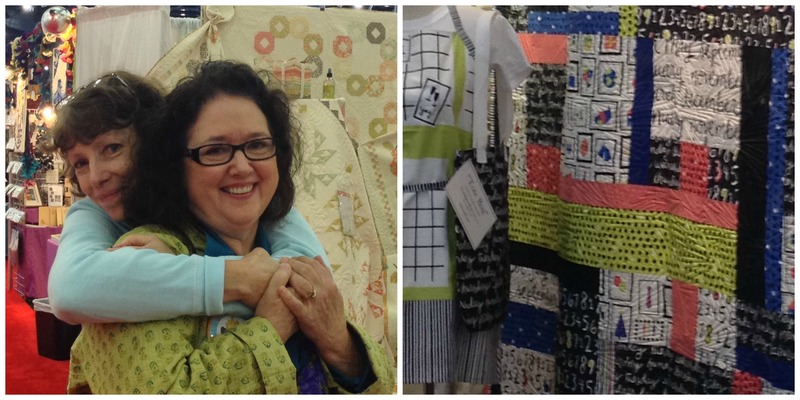 Right: Katie with her favorite book authors, Barb and Mary of Me and My Sister Designs. 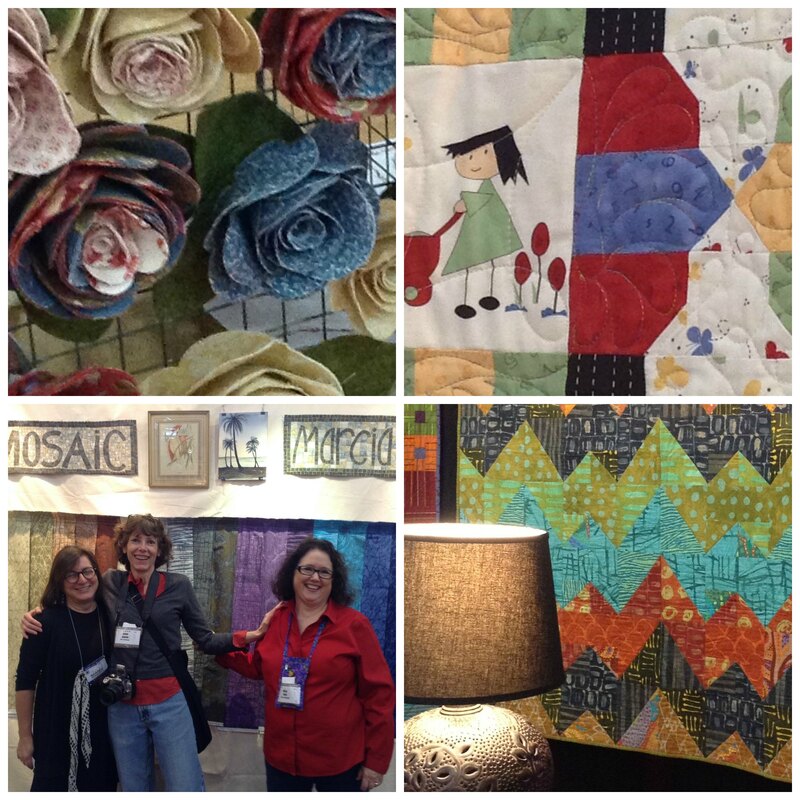 All photos were taken at International Quilt Market. It took some pretty good planning on Karen’s part, but her plane from Michigan and our plane from Boise landed within minutes of each other in Houston Thursday evening. We were met in front of the airport by our favorite taxi driver, Bernard. We spent the drive to the hotel catching up on his life and being entertained by stories of his children. He’s been the driver of choice for several years now, and we consider him the friendly face that greets us in Houston. A bit of unpacking and a restful night followed, and then it was time for school. School? Yes, the first day of Market is called Schoolhouse. 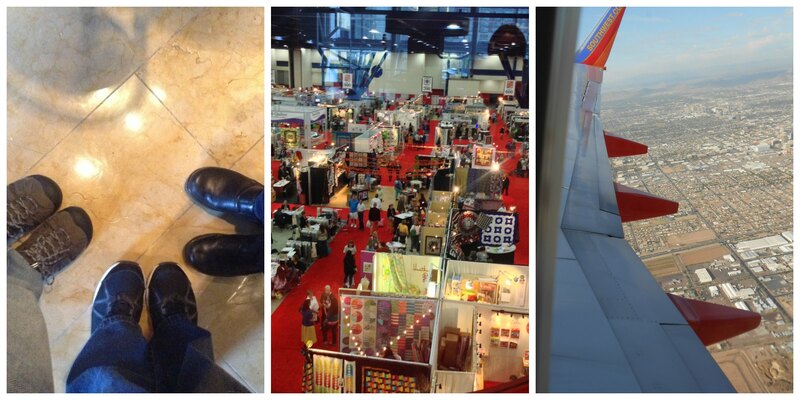 After a much needed cup of coffee, we headed to the Convention Center to sit through fourteen sessions. 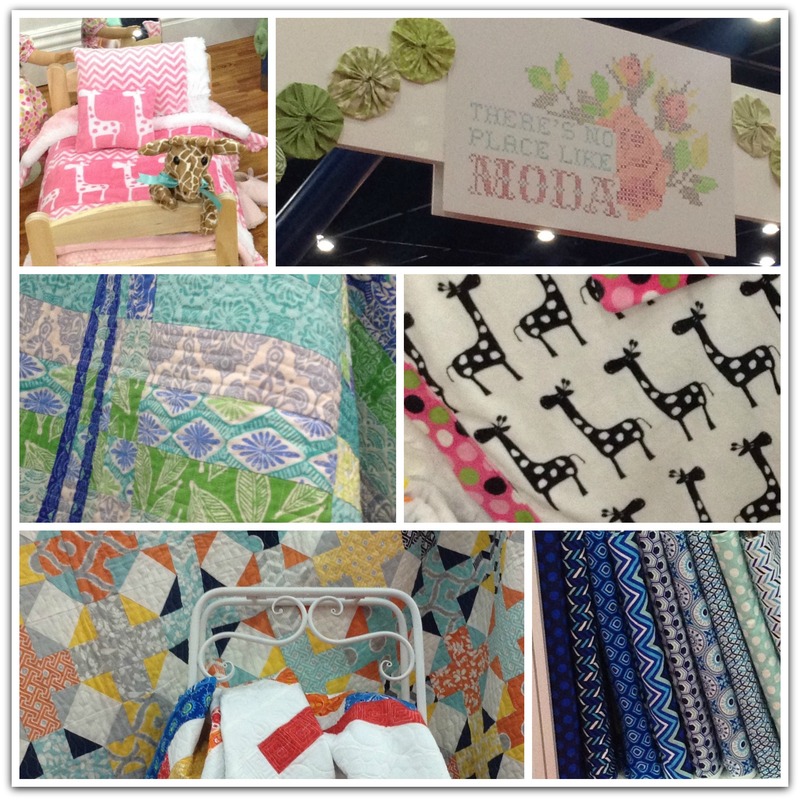 The topics vary from new collections, patterns and books; marketing strategies; trends; block-of-the-month programs and, yes, how to run a successful long-arm business. With so many sessions to attend and topics to discuss, it’s hard to condense it in a quick blog post. 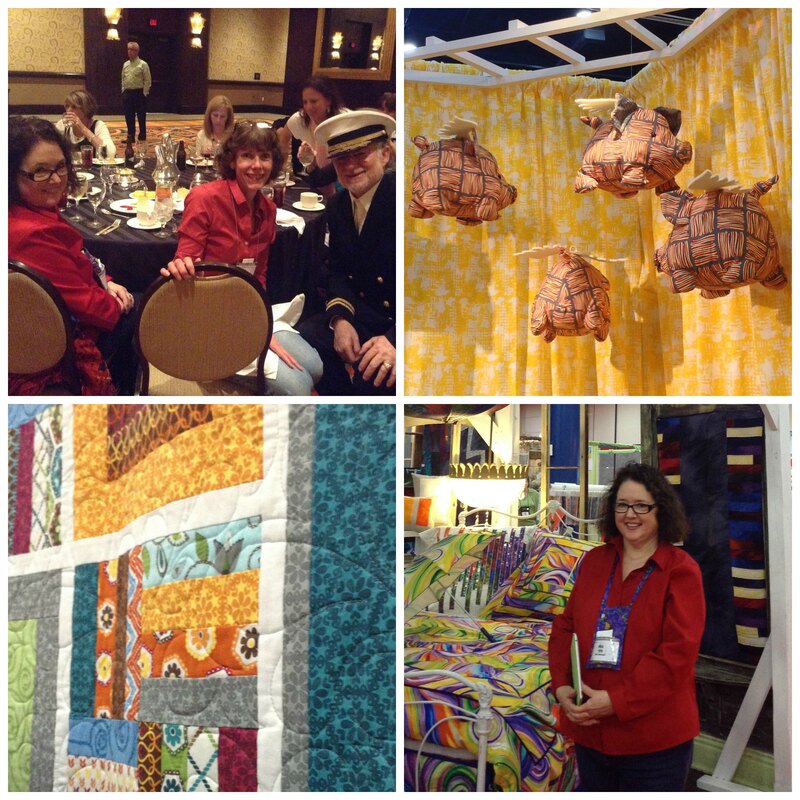 However, there is a reoccurring theme that comes to mind as I think back on the day: What inspires you to quilt? 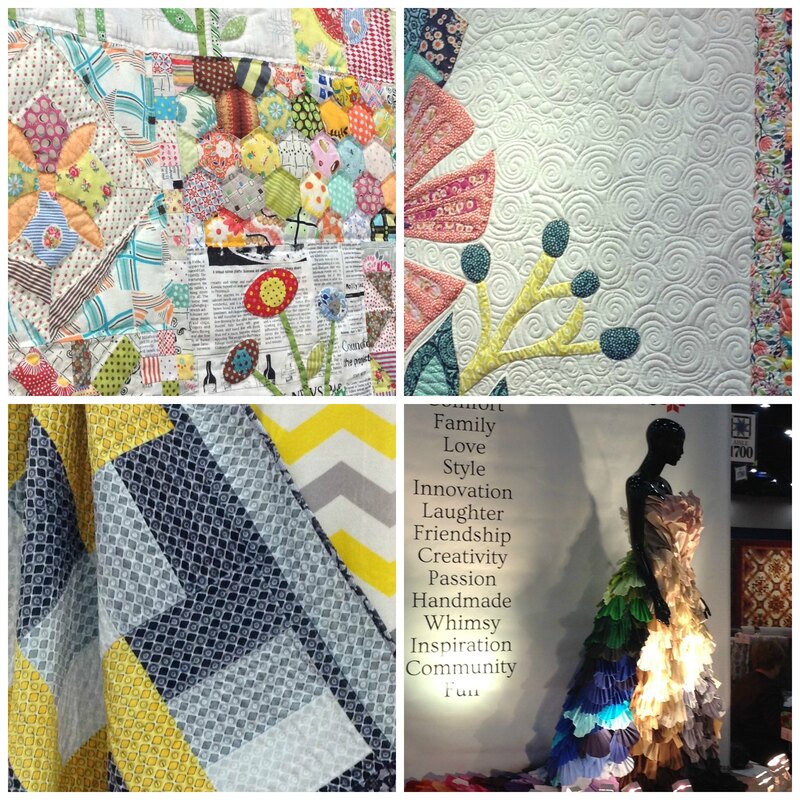 Our inspiration can come from so many places: patterns, fabric collections, quilt shows, our local quilt store, or show and tell between friends and/or guilds. 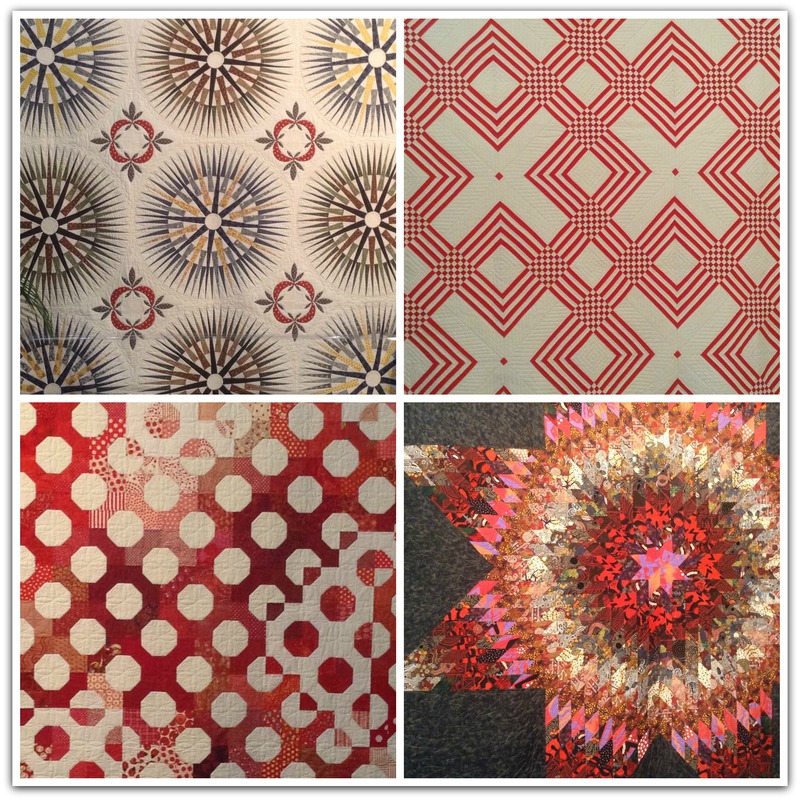 We can receive inspiration from what we see around us, whether it’s something in nature like the colors of a sunset or something we encounter in our daily life, like the tile pattern on a motel floor. 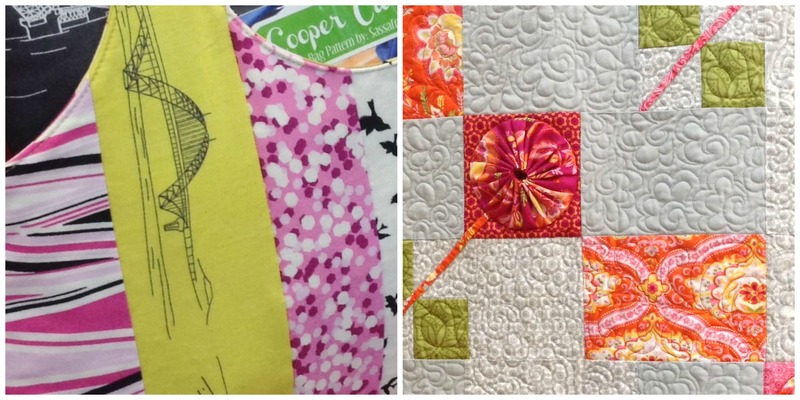 We can also be inspired by how quilting makes us feel. 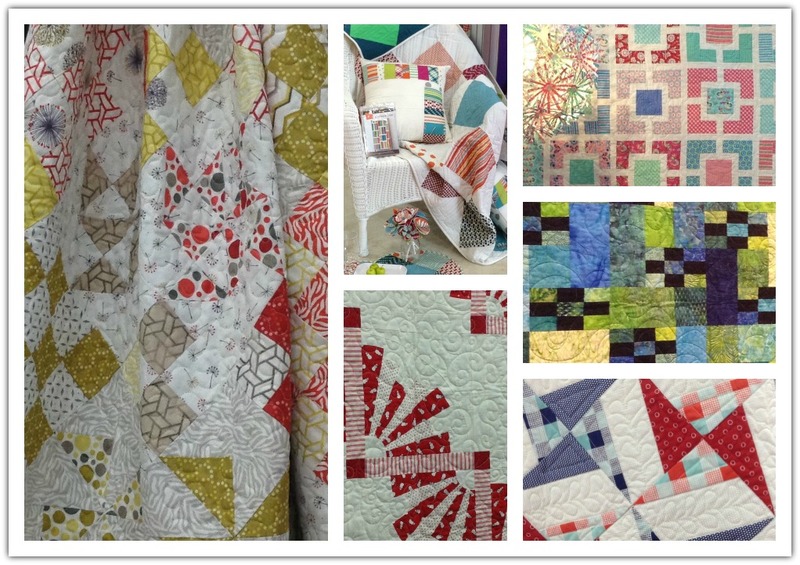 There’s something so special about working on a quilt for a loved one; we put such thought and care into choosing the perfect pattern, fabric, quilting design. 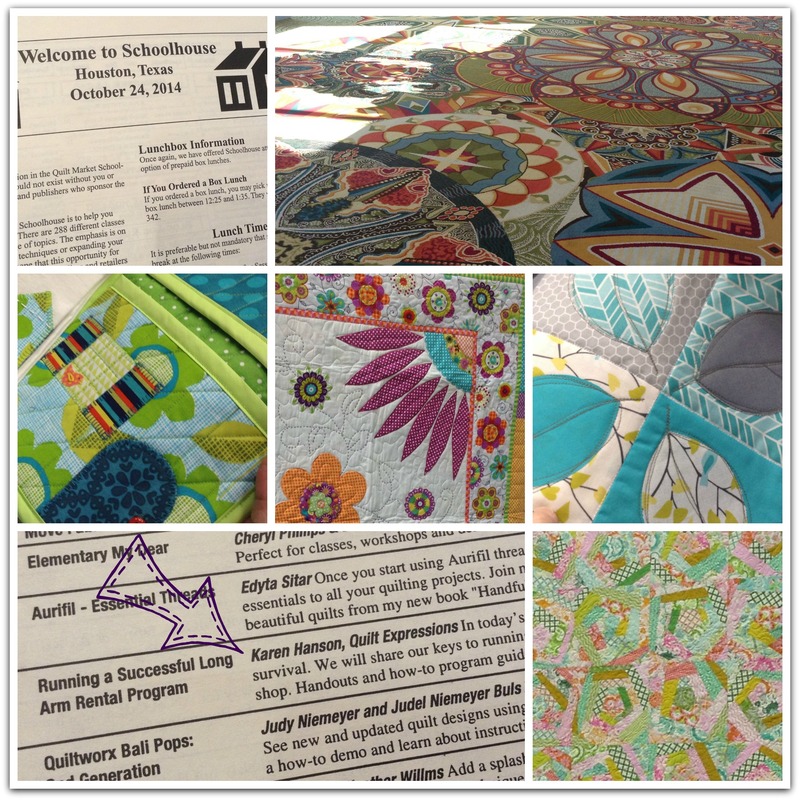 They are never far from our thoughts as we work on the quilt. So, since we attended school today, and, in Karen’s case, taught it, I thought I’d give you a small homework assignment. 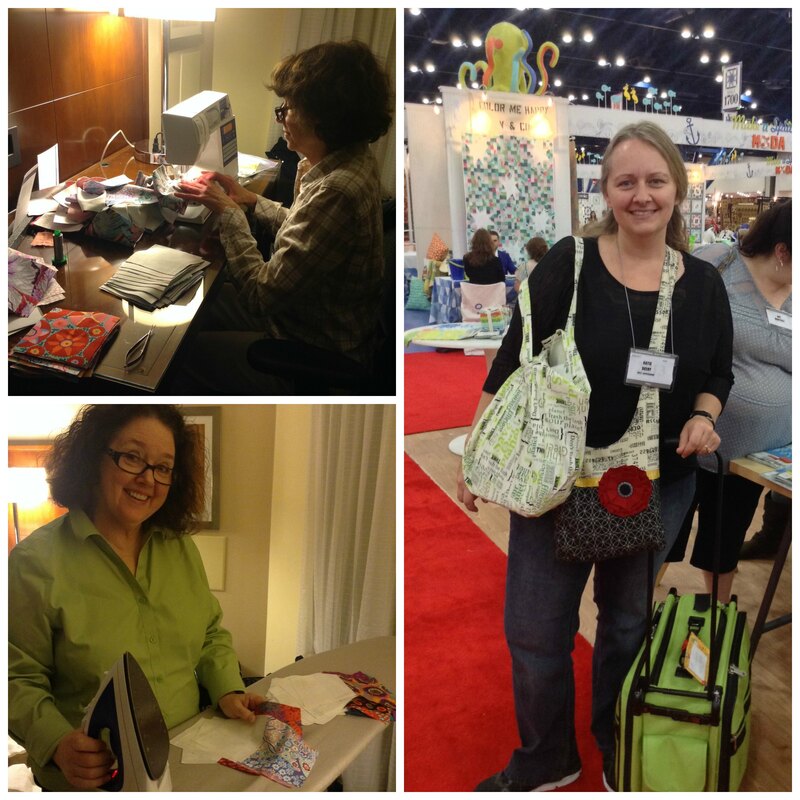 Just a question….what inspires you to quilt? Please feel free to share your answer either here or on Facebook. 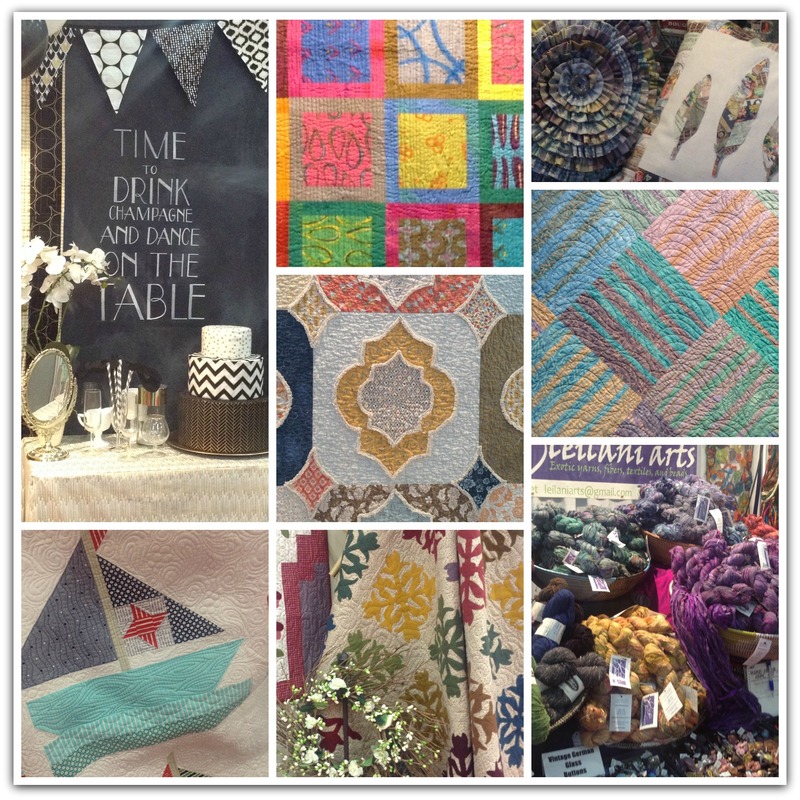 Sunday was our last day at Market. It was a short one…just four hours so we could make it to the airport for our flight home. We’d visited all of the booths we’d needed to, made the purchases we’d planned on, even left the Tutto (Della’s bag on wheels that liked to follow us around) at the hotel. 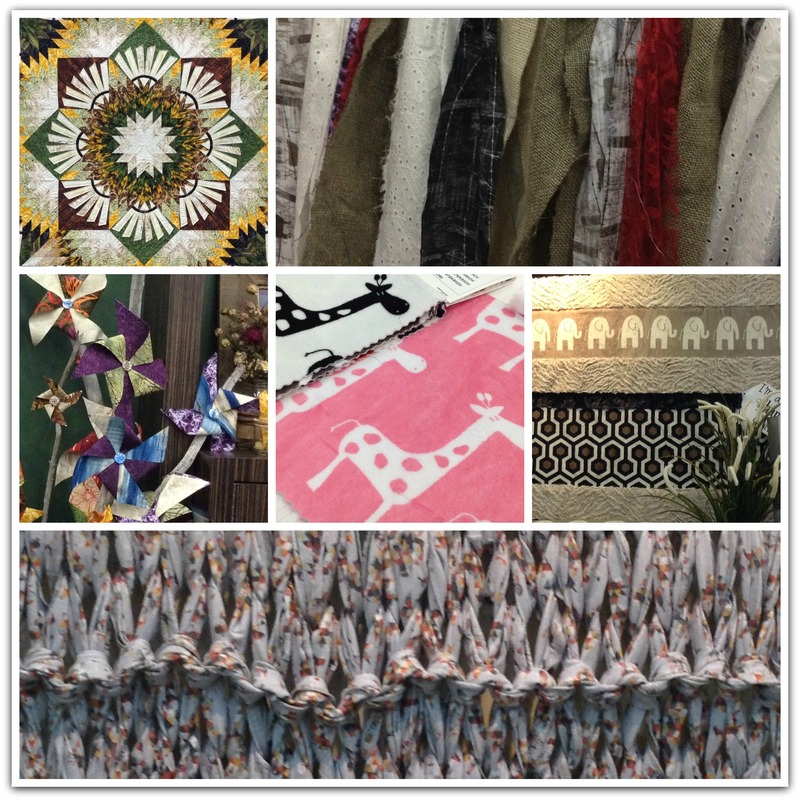 We meandered through aisles, visiting a few more booths that we’d developed an interest in over the course of the market. It was more relaxed with the work mostly done. More relaxed, but definitely not boring! I was quite entertained watching Karen. She received a stern look from a fabric-covered lady when Karen tried to tell her very well-behaved dog hello, she took a nap on a pile of minky, and even moved to the other side of the counter, enthralling one of the distributors with her demo skills. 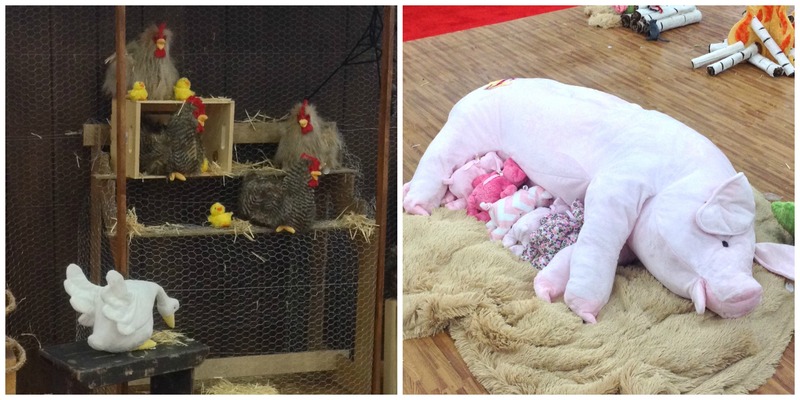 Here’s a peak at our last day….and, yes, I found some more farm animals and a….zombie doll?! 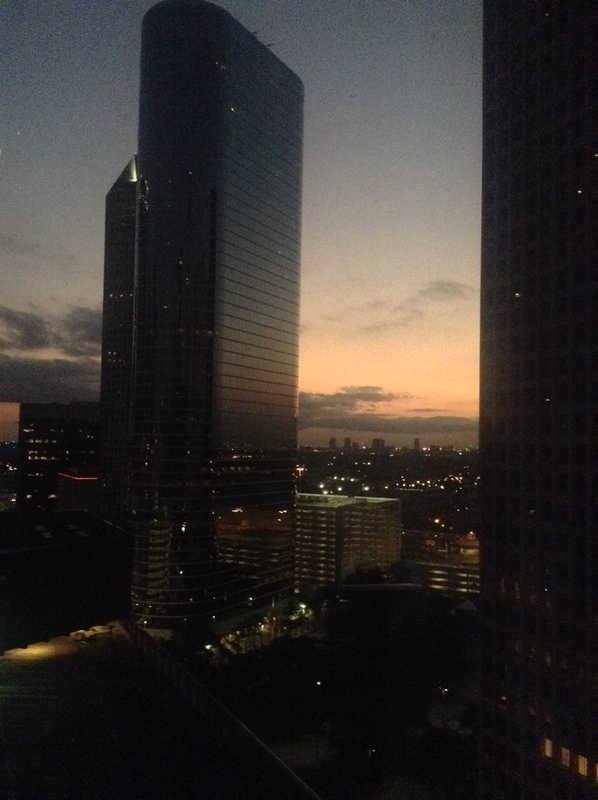 As the sun sets on our last full day in Houston, Karen, Della and I meet to discuss what we’ve seen. 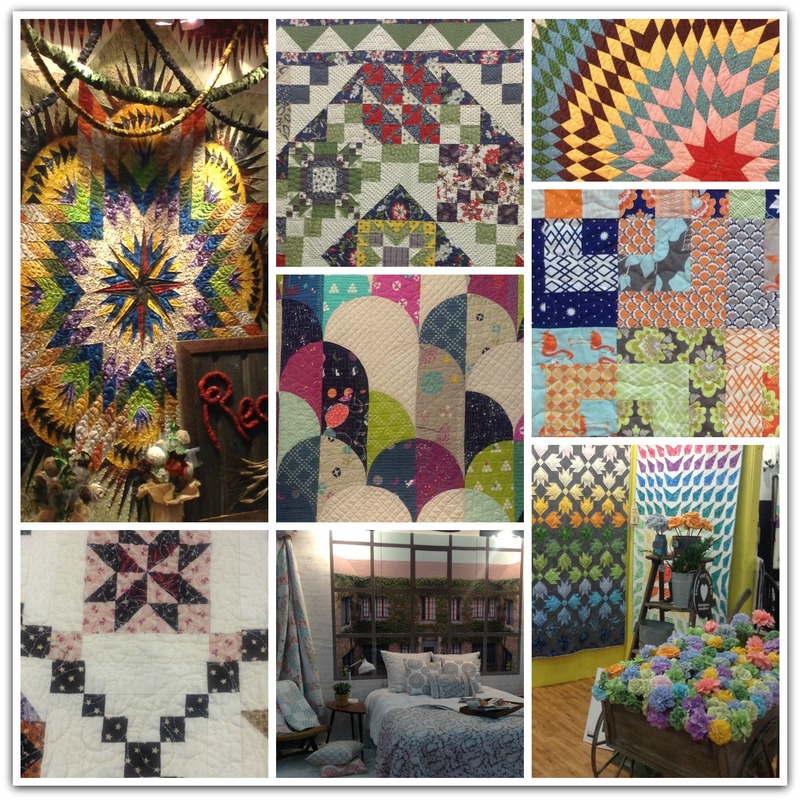 We’ve seen some pretty amazing quilts, patterns, and fabric collections (I can’t wait for them to arrive at Quilt Expressions over the next six months! ), a few things that caused a giggle or two amongst us, and some, well, farm animals. All of these have combined together to create an experience I will never forget. 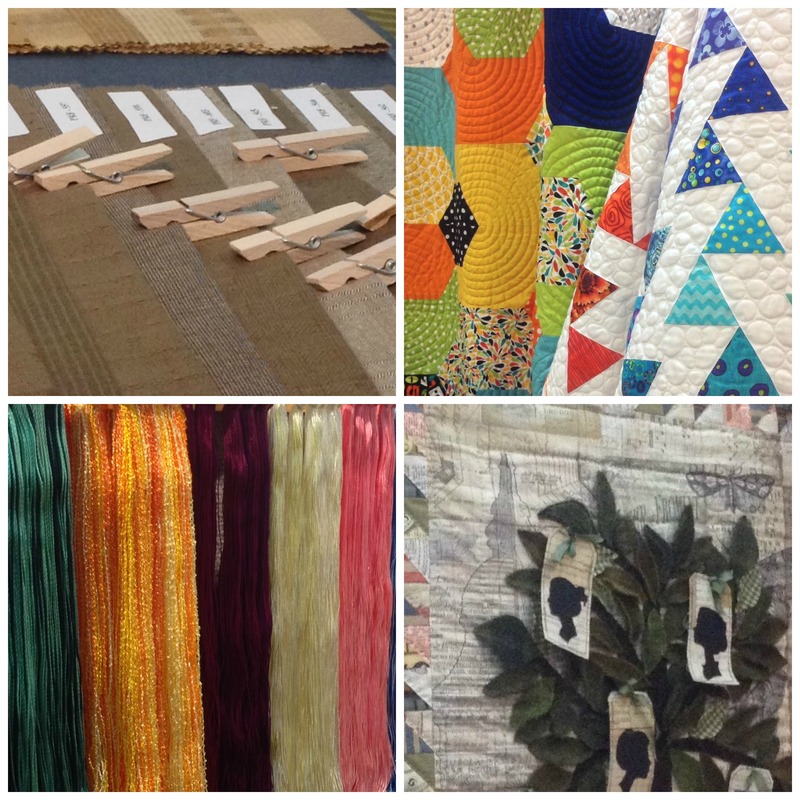 I’ve learned so much about how fabric/notions/patterns are created, packaged, sold, shipped, etc. Who knew so much went on behind the scenes! I’ve arrived at my temporary office (my favorite table next to Einstein Bros bagels in the lobby…prime real estate!) to write my final blog post from here in Houston. Most days when I write, I have an idea, a photo, something to work from. Tonight, not so much. I didn’t randomly tell Karen and Della that I needed their feet for a photo (crazy thing….they didn’t even ask why….just walked them right over to me! ), I’m out of airplane pictures, I didn’t meet any well-known authors today (although I did pass Amy and David Butler on the way to the restroom!). What to do?! Unfortunately, I made the mistake of mentioning this to Karen, so she forwarded a lovely photo that she’d taken on her phone to me and informed me in her most boss-like voice that it was what I’d use. Well, um, anyway….I thought I’d just post a whole lot of photos showing what we saw today. 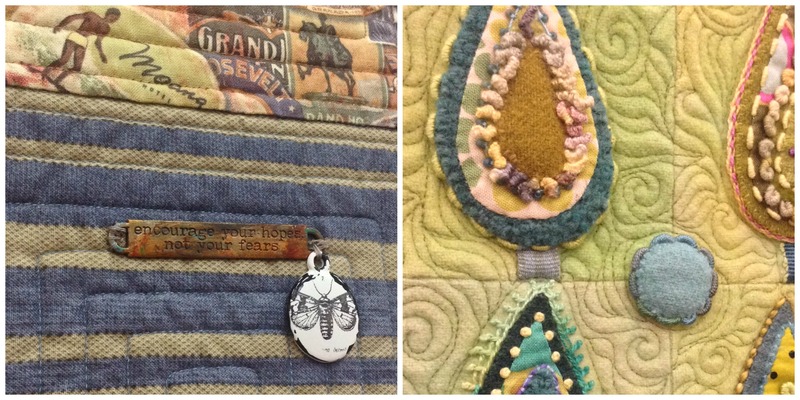 Alrighty, this concludes your tour of today’s Quilt Market sights. 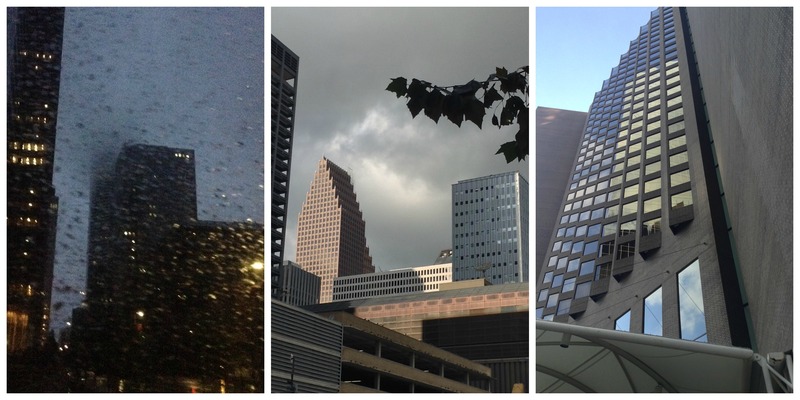 Now, how about a couple photos of the beautiful city of Houston. 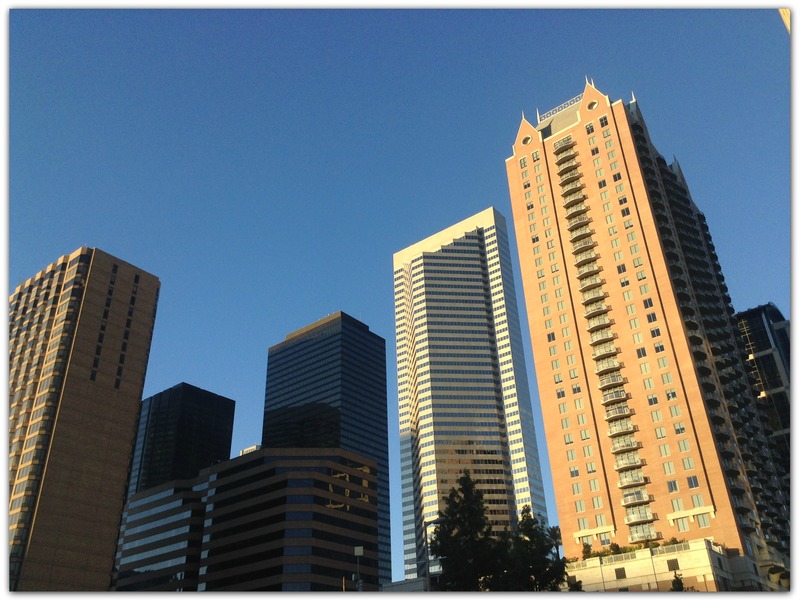 You might recognize some of the buildings…we’ve walked the same three blocks for three days, but they are a beautiful three blocks! The opportunity to experience all of this…. As an extra bonus tonight, I’m leaving you with one last collage. Last night, after we returned to the motel, I headed down to the lobby to write the blog post. What did Karen and Della do? Go to bed? Well, of course not. They started on the next Stashbuster pattern! 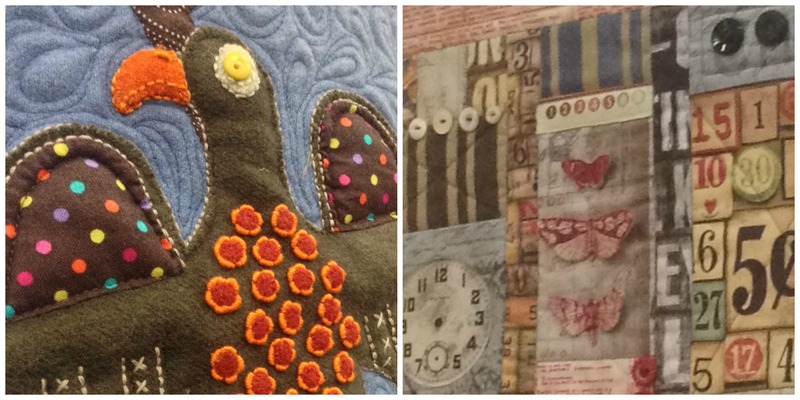 Karen’s sewing machine really is her constant companion!